Mohammed Gammoudi is a four-time Olympic medalist from Tunisia. This year is the 50th anniversary of his winning the Gold Medal in the 1968 Olympic 5,000 meters in Mexico City, following earning the Bronze Medal at 10,000 meters at those Olympic Games. Four years earlier Mohammed was the Silver Medalist at 10,000 meters in the 1964 Tokyo Olympics, nipped by four-tenths of a second by Billy Mills. At the 1972 Munich Olympics he won the Silver Medal at 5,000 meters behind Lasse Viren. An African boycott of the 1976 Montreal Olympics prevented his fourth Olympic participation. 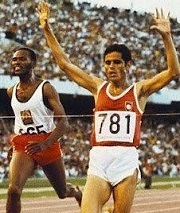 Mohammed won the 1968 International Cross Country World Championships by one second over Ron Hill, an improvement from his Bronze Medal finish in 1965. He won the Mediterranean Games 5,000 meters and 10,000 meters in 1963 in Naples, Italy and repeated the two victories in 1967 in Tunis, Tunisia. His personal best times include: 800 meters – 1:51.2; 1,500 meters - 3:41.9; 3,000 meters – 7:50.2; 5,000 meters - 13:27.33 and 10,000 meters – 27:54.69. Gammoudi and France’s Alain Mimoun are the only two distance runners to earn Olympic Medals in three Olympics in the post-World War II amateur era. This interview was conducted by Mohammed’s daughter, Nadia, asking my questions which I e-mailed to her and transcribing in French. I used an online translation program and lightly cleaned up the grammar and diction. Thank you to both Mohammed and Nadia for their time and effort. GCR: It’s hard to believe that this year marks 50 years since you won the 1968 Olympic 5,000 meters in Mexico City. Since you had come close and won a Silver Medal four years earlier in Tokyo in the 10,000 meters, could you compare what you thought beforehand it would mean to win the Gold Medal versus how it felt when you crossed the finish line and when you received your medal and heard your national anthem? MG Even if I was well prepared, it’s difficult to explain the exact feelings. It was a mix of apprehension, fear and determination at the same time. I remember what our president in that time, Bourguiba, told me before I left for Mexico, ‘Bring me the gold and I will give you what you want.’ My answer was, ‘I’ll bring the gold and you’ll come with me to take it my childhood home,’ a small place in the south of Tunisia, called Sidi Aich. The desire of my mum was to see the President, and this was important for me. Both of us honored the promise, and there are no words to explain my happiness when I heard my national anthem on the top of the podium! GCR: On the last lap both Kenyans made moves – Naftali Temu on the back stretch and then Kip Keino in the final 100 meters. Could you describe your move to hold off Temu and then to summon up the energy to pull away from Keino when he pulled up right next to you with 50 meters to go? MG From the beginning, I knew that they were favorites, they live in altitude and were comfortable with it, which is not my case. I noticed the move of Temu when I was already in my speed tempo and I decided to continue it till the end. I was hearing the breath of Keino which sounded labored, I focused on the finish line and it was impossible for me to decrease the tempo before I arrived at it. GCR: Kip Keino and you were in the same 5,000-meter qualifying heat and you finished 0.60 seconds behind Keino. Did you learn anything about Keino’s fitness and tactics in the qualifying heat which helped you in the final? MG Kip Keino is a great runner and, before the final of the 5k, I asked him and Temu to work together and, for the finish, each of us to go for himself. But they laughed on me and didn’t accept my offer. GCR: Two days before the 5,000-meter qualifying heat you raced to the 10,000-meter Bronze Medal about fifty meters behind Naftali Temu and Mamo Wolde. Could you describe how this race played out, if the high altitude affected you, and then how you were able to beat Gold Medalist Temu four days later in the 5,000-meter final? MG The 10,000 meters in Mexico, was a bad result for me. My Coach Nezbeda from Czechoslovakia had prepared me for two Golds and I can’t say that I was satisfied for this race. I did a lot of training at a camp in Mexico before the games for the problem of altitude, so I was ready for it. GCR: What did you do in training to be at peak physical and mental preparation, so you could race your absolute best in Mexico City’s high altitude? MG I trained very hard and many times I did more series than what my coach asked me to do. I remember that sometimes I did the double of the program that my coach gave to me. GCR: Could you explain a bit further about how your altitude training and then your earlier result in the 10,000 meters contributed to your 5,000-meter race? MG My preparation was carried out to perfection with a series of stays at altitude in Font-Romeu in France and in Mexico even during the pre-Olympic Games and in Flagstaff, Arizona in the USA at more than 2,000 meters of altitude. All this finally paid off with the new coach Nezbeda. I was well prepared and my apogee. All delegations were apprehensive about the altitude of Mexico City which is 2,277 meters. Only stress and pressure weighed heavily on my shoulders. I could not get to sleep for three nights before the 10,000 meters. I was this time counted on by a whole country without forgetting the promise made to President Bourguiba to bring back Gold. After my third place in the 10,000 meters behind the Kenyan Temu and the Ethiopian Wolde, it was the beginning of the delivery. Nothing could stop me from getting the Gold in the 5,000 meters despite the presence of Kenyans and company. At the end of a fiercely disputed sprint, I beat Keino by two tenths of a second. It was one of the biggest surprises of the 1968 Olympics. GCR: We spoke briefly about this, but how important was it to Tunisia and to your country’s President for you to have Olympic success in 1964? MG Before the 1968 Olympics in Mexico, I promised President Bourguiba to win the Olympic title after the money was obtained for our athletes to compete in Tokyo in 1964. Everyone understood his responsibilities even if at that time it was difficult to master the preparation for the Olympic Games or for all the coaches and officials to accompany our top athletes. During his visit to Belgium, where I was on probation, the President paid me a surprise visit. Alas, I was not on the scene of the training but on a tour of meetings between London and Dublin. Mr. Bourguiba was very angry because the leaders did not know anything too much at the start. I still remember the historic speech of President Bourguiba in September 1960 after the small exit of our delegation to the Olympics of Rome 1960. It was a decisive turning point for Tunisian sport, a visionary speech, a sort of essential roadmap with a strong political will. GCR: Let’s talk a bit about your other Olympic races. First, in 1964 the Olympic 10,000 meters had a strong field led by the heavy favorite, Ron Clarke. The top American, Gerry Lindgren, was slightly injured and his teammate, Billy Mills, was an unknown factor. Did you think you had a chance to earn a medal? MG Yes, my ambition in Tokyo was to get a podium, since it was my first Olympic Games and I didn’t have much experience. But I knew the great Billy Mills since I raced against him in Belgium for the military world championship, where I won and had also run many times against Ron Clarke, who was an inspiration. GCR: Entering the back stretch on the last lap Billy Mills was shuffled outside by Ron Clarke as you took the lead. What were you thinking of your prospects to win the Gold Medal at that point? MG Honestly before the race I wasn’t sure I had a chance to get the Gold, but I thought about it during the few seconds before Billy Mills surprised me from behind. It was a great race and Billy deserves this medal and his final sprint is unforgettable! GCR: That home stretch was legendary as you held the lead over Ron Clarke while Billy Mills swung very wide and looked like he was shot out of a gun with his kick in the final 50 meters or so. How surprising was the move made by Billy Mills and what were your emotions as you earned an Olympic Silver Medal, but came so close to the Gold Medal? MG Of course, I would love to win the Gold, but I always says that Billy Mills deserved it because his finish was just amazing and surely, we can talk about surprise. I used to watch behind me, but I thought he was too far back. I was focused on the finish line plus I didn’t have enough. Maybe if I took another look behind, but he sure surprised me, and I hadn’t the time to realize what happened. GCR: Sometimes in defeat we learn a lesson that ultimately helps us to succeed. Do you think that you outkicking Billy Mills in the 1963 World Military Championships 10,000 meters in Belgium helped him? And is it true that after that race you told Mills through a translator that he needed to work on speed and then after his Olympic win you said he had too much speed? MG Yes, exactly! And he did it in Tokyo! Billy Mills and Ron Clarke were very special, we had our battle and I’m proud of this Silver Medal. I don’t know how to explain, but despite the battle, it was a kind of a deep respect between us. My pride is to get a medal between two runners like Mills and Clarke and, yes, for the fun I told Billy that he had too much speed. GCR: Is it true that before your first Olympic participation in 1964, you contracted an injury in 1963 that almost compromised your career? MG Yes, after intensive preparation in Belgium during the winter season of 1963, I suffered recurring problems of tendinitis, which was inflammation of the tendons. This prompted Mr. Hamouda Hassine to send me to Lausanne to have surgery and strengthen a stubborn ankle. Thankfully, I had excellent care from Dr. Paul Martin and Perret. At the time, during my various competitions abroad, I did not yet have the contribution of a real staff, but we always ended up finding alternatives. With a real manager, I would have been able to beat world records. GCR: What were some of the difficulties and obstacles you had to overcome at your first Olympics in Tokyo in 1964? MG There were several challenges, there was the eight-hour time zone change, rainy weather, the massive influx of African countries, mostly from the highlands and the ashy track surface which was a sort of mixture of earth and crushed ashes. Under these conditions, the Silver Medal I won in the 10,000 meters in the direct final without preliminary races and in the presence of 37 runners, is a miracle even if I had the chance to participate in the pre-Olympic games of 1963. It was kind of a repetition in preparation for the 1964 Olympic Games. In fact, after my double at the Mediterranean Games in Naples, my country’s leaders had the lofty initiative for me to go directly from Italy to Tokyo for acclimatization purposes. Only my lack of experience deprived me of the Olympic title because I should never have sprinted 250 meters from the finish but waited later to the last 50 meters. It was also a youthful mistake despite a perfect race where I dominated world record holders like Clarke or Bolotnikov. I learned a lot from this participation. I must remember also that I was forced to not participate in the 5,000 meters final due to blisters to the feet following repeated friction inside my spikes. Bad medical care cost me a second Olympic medal! I cannot believe again that during the preliminaries, I beat the future Olympic champion Bob Schul from the USA. GCR: Looking forward to the 1972 Olympics, first how sad was the terrorist attack and how did this affect you mentally and emotionally? MG Yes, 1972 was full of bad memories. First was the attack which affected all the world and made me really sad. Sports and especially the Olympic Games should be governed by two thoughts – first is peace and tolerance and second is fair play. GCR: In the 10,000 meters you unfortunately got tangled up with Lasse Viren just before halfway, were at least 100 meters back when you resumed racing and dropped out a lap or two later. How disappointing was this and did it make you resolve to really race strong at 5,000 meters a few days later? MG Yes, this was my second bad memory in that Olympic Games. Actually, I was deeply affected and especially when I wasn’t supported by my delegation, unfortunately, and they left me alone. I wouldn’t have raced the 5,000 meters at all and the unique person who supported me was my wife. I was crying in the room and was frail and told her that I’ll not continue, but she supported me strongly and definitely this medal was because of her support. GCR: The 5,000 meters went out very slowly before Steve Prefontaine pushed the pace the final four laps and Lasse Viren eventually pulled away to win with you in second place about ten meters back at the finish. Could you describe how you were feeling during the race, how tough Prefontaine was to push for so many laps and how strong and fast Viren was at the end? MG The 5,000 meters was hard for me from the start to the finish. I had a lot of pressure, my team unfortunately said bad things like I was done and not able to win again. They also said I lost in the 10,000 meters because I brought my wife with me. There were many other unfair comments which destabilized me mentally plus I was injured physically, so I ran with a lot of stress and my mistake was to attack the finish early. Also, I was one of the oldest runners in that race. GCR: With your fall in the 10,000 meters and then all that surrounded the 5,000 meters, how do you sum up your 1972 Olympic experience? MG In general, people view an anecdotal way without making the effort to go and analyze the reality more closely. It is enough that one loses a race or that one falls to say that one is null. In Munich, I was not entitled to the error. The atmosphere was crisp because of the terror attacks and especially my fall in the final of the 10,000 meters. My mission was accomplished especially at 34 years of age to have first completed amending my national records which dated from 1964 for the 10,000 meters and from 1968 for the 5,000 meters. In addition, I reached the podium for the third consecutive Olympiad in front of formidable competitors like the British men, Stewart and Bedford, the American Prefontaine, the Belgian Puttemans, the German Norpoth and the Russian Sviridov. GCR: You didn’t get to compete in the 1976 Olympics due to an Olympic boycott in which Tunisia participated. Were you in shape to challenge for a medal in the two long track events or the marathon? MG Montreal was also a bad point of my career. I was prepared for a podium for the two long track events, but not the marathon. Our president refused at first to boycott the Games since he said that we shouldn’t mix politics and sports. But after pressure he asked us to come back and noted that Tunisia was the last African country to bring its athletes back home. The boycott may have prevented me from establishing at 38 years old a new feat at 10,000 meters. All this remained stuck in my my throat, especially since I was already there in the Olympic Village. Four years of sacrifice and waiting had suddenly evaporated. Destiny wanted it that way. GCR: Another big international competition where you had great success was at the 1963 Mediterranean Games where you earned Gold Medals at 5,000 meters and 10,000 meters, and this led to your victory in 1964 over Michel Jazy just before the 1964 Olympics at 5,000 meters. How important was it to be strong at these Games a year before the Olympics and to race so strongly with Michel Jazy? MG In Naples, I was the only Tunisian sportsman to compete for Gold and to show his Olympic ambitions. The Monaco race in September 1964 was an important step for holding on to 5,000 meters French champion Michel Jazy, the favorite for the Olympic title in Tokyo. We both went under the 14-minute time and only six one hundredths of a second were between us. 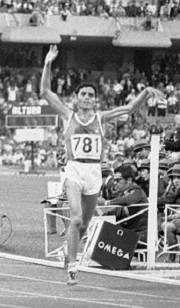 There was also the meeting of Charlety in June 1964 where I became the first Tunisian to go under 14 minutes in 13:58.2. From there we started in Tunisia for the first time to hope for an Olympic medal, but really without really believing it. GCR: During your three Olympiads in 1964, 1968 and 1972, there was a lot of discussion about your participation in the marathon, but this did not materialize, why is this exactly? MG It is true that it was question of a possible participation in the marathon but only in case of failures in the events of the 5,000 meters and 10,000 meters, but failure was not the outcome. It was difficult to consider running the marathon after the podium of the 10,000 meters in 1964 followed by an injury or after having raced four races in 1968 and three races in 1972, including preliminaries and finals. I must admit that given the number of events I raced during each Olympiad and adding to that the fragility of my tendons and the difficulty of marathon course, my participation had become very difficult. GCR: How did your joining the Tunisian Army in 1959 affect in a significant way both your general life and your running career? MG Undoubtedly, the military is my second family. She taught me everything and gave me everything. During my stay in 1960 in the 3rd battalion of Kasserine in the center of Bardo, I benefited from the effectiveness of the military sports organization of our country to make my apprenticeship on healthy and solid bases. The creation of the Central Service of the Military Sports (SCSM) in January 1959 has rendered outstanding service to the national sport. I had the seed of the culture of winning. On the starting line, I watched my opponents. It's as if I sniffed them and then executed my races. Finally, I knew what I wanted. GCR: What was the secret of the effectiveness of this military sports organization? MG You know that after the independence of Tunisia, all the youth of the country had passed into the hands of the army. The leaders recognized and understood that sport is an instrument of training young people on the moral and physical level without forgetting its educational and social virtues. For talent scouting, the SCSM organized a large number of decentralized inter-corps competitions in a number of sports. In addition, the best athletes in the world, the majority of whom are in the military, were rubbing shoulders with this great annual cross-country organization. At the time, it was the International Cross Country Union or the International Council for Military Sport that took turns organizing the international championships from 1903 to 1972 before the International Athletic Federation launched the international championships of the world of cross country since 1972 and those on track since 1983. It should also be remembered that since 1957 the army participated in the athletic competitions organized by the FTA, military and civilian sport evolved in perfect symbiosis. GCR: Distance runners need to build strength through lots of training. What was the volume of your training you would sustain as you built your endurance base? MG Since I was a soldier in the military, we were followers of intensive training and I did an average of 800 to 900 kilometers per month. GCR: Could you discuss the coaches that guided you during your career? MG In my early days there was Hassen Amri of Algerian origin, as well as Tunisians Abdesattar Bouhajba and Sai Laabidi. Many military officials and technicians at various federal ministerial levels helped me to evolve as an athlete before having the honor to admit their incapacity to be able to follow it at the highest level. That is how the choice was made that it was wise to entrust my preparation to other more expert hands before the 1964 Tokyo Olympics, like Joe Mallejac, the former French coach of Michel Jazy. Another was the Czech Coach Jiri Nezbeda, from the great school that produced multiple Olympic champion Emil Zatopek from 1948 to 1952, who was later named national coach in 1967 and 1968. Without a doubt, it is the late Hassine Hamouda who has worked most in my career. As a point of history, Hassine Hamouda was the first head of mission of the Tunisian delegation to the 1960 Olympics in Rome. GCR: Will you provide some more detail about the influence of Hassine Hamouda? MG Indeed, Mr. Hassine Hammouda was the man of the state of affairs and of a great contribution with his rich notebook of addresses and great knowledge of the world of international sport. He considered the sport of competition like a patriotic act and a national service. At the dawn of Tunisian independence, Mr. Hamouda was recalled by President Bourguiba to return from France to set up the famous Central Service of Military Sports Tunisians. Mr. Hamouda took care of the logistics of our international participation. It is he who allowed me to follow long training segments in France and Belgium where I followed my preparation under the rule of their staffs before the recruitment in 1967 of the Czech Coach Jiri Nezbeda. Another detail that comes to my mind during my first international experience in August 1962 was at the CISM championship in Amsterdam. Mr. Hamouda oversaw modifying my program by relying on the list of commitments. This is how I contended in the 5,000 meters instead of the 1,500 meters where I had less chance to finish at the top. Finally, I won my first title at 5,000 meters. Mr. Hamouda was a great friend of the president of the Belgian Olympic Committee, Mr. Mollet, well known for his knowledge of sport sciences. This friendship was instructive and very useful especially at the beginning of my career. Mr. Hassine Hamouda was my main supervisor with MM Ahmed Nachi and Moncef Zenaidi. GCR: With your success at both 5,000 meters and 10,000 meters, which race do you consider to be your prime racing distance? MG I am a 10,000-meter runner who has always prepared for this event well. 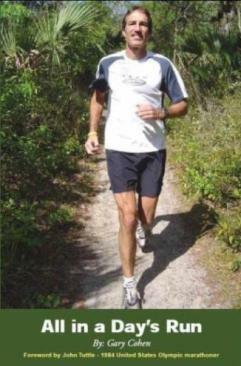 Once I achieved the acquired endurance, it helped me to succeed over 5,000 meters. Over the course of my career, quality has been put on more than quantity. GCR: With six Olympic finals and four Olympic podiums over your career, can we say that your record was unexpected for the country of Tunisia which had only been independent for eight years in 1964 when you earned your first Olympic medal? MG Yes and no, my feeling is mixed. First, I have the strong conviction that I could have done better with a more appropriate accompaniment. Second, given the conditions I experienced during the latter part of my career, especially after my fall in Munich in the 10,000 meters, I told myself that my mission was well accomplished. After Montreal, I decided to retire in beauty. Thank God. GCR: What is your biggest regret? MG It was not to have had the opportunity to count during my career on a real manager who could have complemented the efforts made by the military and civil authorities of my country. I needed a manager to put me in large meets and defend my interests. With his help, I could have been programmed to beat World Records. During the Olympic Games, I beat many World Record holders in the 5,000 meters and 10,000 meters, like Australia's Ron Clarke, Kenyan Kip Keino, Russia’s Pyotr Bolotnikov, Britain’s Dave Bedford and Belgium's Emiel Puttemans. Some irresponsible people abused my confidence to divert a good part of my bonuses awarded at track meets. I was also asked to go down from altitude to make inappropriate competitions without full preparation. GCR: Earlier this year you had some health setbacks and spent time in the hospital. How is the current state of your health? MG Praise Allah, I thank God, everything is back in order. I am in good shape today. I take this opportunity to thank everyone who was kind enough to visit me or ask for news. Finally, at the end of this long career, what matters most is love, affection and respect for Tunisians as well as the national sports movement. GCR: You are still a national hero and in the memory of all generations of Tunisians even though you ended your athletic career more than 42 years ago. Is there a great feeling in your country for Mohammed Gammoudi the champion, but especially Mohammed Gammoudi the man? MG I have always been the son of the people. My behavior on or off the track has been exemplary. It was also necessary for me to give an example to the Tunisian youth. After the independence of Tunisia, because of my sporting exploits, I made shine the national sport, and gave pride and happiness to the Tunisian people by proving during my international outlets the ability of young people that the impossible is not Tunisian. I was especially marked forever in February 1968 on the occasion of my winning the international cross-country championships of the world organized within the framework of the CISM (international council of the military sport), on the race course of Kassar. Tunisians came in large numbers to support me as well as the Tunisian team. After my victory, we had to see the enthusiasm and joy of our supporters in the stands and outside. This has certainly created vocations for the youngest. Khamassi, Zaddem, Zammel, Ayachi and many others were big competitors at the time.